FC Goa beat Chennaiyin FC 2-1 thanks to strikes from Ferran Corominas and Brandon Fernandes to lift the Hero Super Cup final. Rafael Augusto scored for Chennaiyin. Get highlights and analysis of the FC Goa vs Chennaiyin FC Hero Super Cup final below. 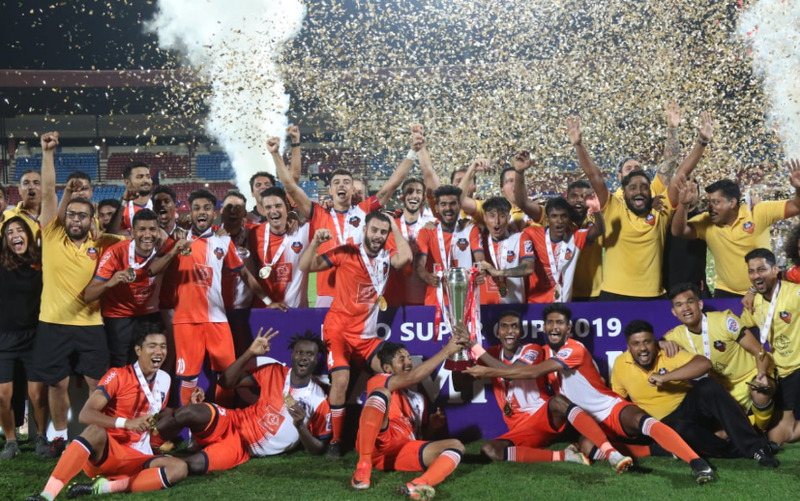 FC Goa players celebrate at the podium after winning the 2019 Hero Super Cup in Bhubaneswar. Get highlights and analysis of the FC Goa vs Chennaiyin FC Hero Super Cup final below. Before we talk about anything else, here are the line ups FC Goa (4-2-3-1): Mohammad Nawaz, Seriton Fernandes, Mourtada Fall, Carlos Pena, Saviour Gama, Lenny Rodrigues, Edu Bedia, Hugo Boumous, Jackichand Singh, Brandon Fernandes, Ferran Corominas. Just the one change from their win over Chennai City, Edu Bedia walking back into the squad after serving his suspension. Zaid Krouch misses out, and frankly, in the game against Chennai City he may have been the sole player with a below average rating for Goa. Chennaiyin also have one change, Christopher Herd replaced by Francisco Fernandes in the midfield. Chennaiyin from left to right and Goa go the other way. In case you lost your feed for a bit, not to worry, its normal, there’s an IPL game on. Star don’t care about football. 2’ Goa have a corner. And after playing it short, Edu Bedia drops a brilliant cross in, but Mailson clears. Thapa starts a counter. Comes to nothing. 3’ Goa have started their pinging about. As they do. They’ll do this till the 88th minute, and then Chennaiyin will score two to take the trophy. Erm. 4’ Some great pinball from Goa. Eventually Jackichand takes a shot, which takes a deflection off a Chennaiyin player, and Karanjit saves. 5’ Edu Bedia wins the ball and turns, swerves, pushes, shoves, feints, covers and then releases the ball calmly to Augusto. That was a brilliant 20 seconds of individual football. Seriously was. Teaches you all you need to know about how to hold the ball. 6’ Corner to Goa. CK Vineet clears at the near post. Corner again…. 7’ ... goes long, ball falls to Scorominas off a botched Mailson clearance. But he hits it high and wide. Corominas it is. Not Scoro. 8’ Vineeth is fed a beautiful ball by Jerry, but he is offside. Correct call. For all the umpires bashing happening in the IPL, football referees are doing alright. 11’ Chennaiyin have a corner and Dhanapal Ganesh launches it a little too long. Bad delivery. 12’ Chennaiyin have the best chance of the game. A brilliant run by Laldinliana from the right, after Vineeth and Ganesh had opened up Goa had Goa’s defenders scampering. Eventually cleared, badly, Laldinliana has another shot. Phew!! Too. Much. Action. 14’ Chennaiyin have started to assert themselves on this game. About time. Took them 70 minutes last time out. 15’ Outstanding visual there. Mourtada Fall shielding the ball away from Francis Fernandes. True David-Goliath bit there. 17’ Chennaiyin have a corner. Mailson gets a head to it but it falls on Edu Bedia’s foot. Thankfully for Goa. 20’ Oh wait. He’s getting a hamstring rub down. Everyone looking a bit worried. Arjun Pandit says he’s been playing strapped the entire season. That’s a bit concerning. 21’ Mandatory crowd update: There is a crowd today. Not bad at all. Adn Goa have another corner. 22’ Brandon delivers, but there’s a foul in the box. What a waste.